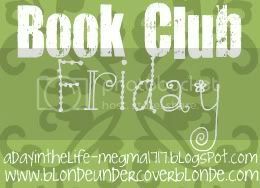 So Heather over at Blonde...Undercover Blonde has a weekly Book Club link-up and I've decided to participate! Sylvie Serfer Woodruff is stunned when her husband, Senator Richard Woodruff, is exposed by the press for having an affair with a staffer. Though Sylvie is humiliated, she agrees to stand by Richard’s side during his mea culpa press conference. As soon as it’s over, she heads to a house in Connecticut owned by her family, not sure whether she wants to end her marriage or not. The Woodruffs’ two daughters are at similar crossroads in their lives. Diana, a physician with a young son, is carrying on an affair with a younger man after growing weary of her marriage, while her younger sister, Lizzie, a recovering addict, is trying to rebuild her life after a stint in rehab. Realizing she has always put Richard first before her children, Sylvie makes a bid to have her daughters join her out at the Connecticut house and is surprised to find their lives as tumultuous as hers has become. Weiner’s trademark blend of wit and sensitivity distinguishes this timely tale about a family in crisis. I love Jennifer Weiner. I loved Good in Bed, Little Earthquakes and Certain Girls. Although her main characters are much older in this one, she's a talented enough author to keep my interest. Fly Away Home wasn't quite as entertaining as some of Jennifer's other books, but it was still an engaging story. I found it difficult to empathize with Diana, but really cheered for Lizzie. There's SO MUCH going on in this book that it seemed like two-thirds of it was backstory. It made for a slightly tedious read at times but with drug-use, affairs, surprise pregnancies, political spotlights, and the emotional baggage of three grown women...well, I guess it was necessary. I would definitely categorize Fly Away Home as "women's fiction" rather than "chick lit" as the pacing was somewhat slow. If you haven't read Jennifer Weiner before, DON'T start with this one. Pick up Good in Bed and give this one to your Mom. Also, if you're on Twitter, you should totally follow Jennifer. She's really pretty funny. I loved Good in Bed! I haven't read much of Jennifer Weiner's other stuff. I'm glad you reminded me of her. I need to pick up another one of her books!